「덕천(德泉)」명(銘) 청자는 여러 예가 있지만 이 매병의 경우와 같이 입체적인 기형에 문양 및 유태 등 상태가 양호한 것은 드문 편이다. 특히 변형된 여의두문대(如意頭文帶)와 파초연화문, 유문(柳文)의 형태가 고려상감청자의 기본형에서 크게 벗어나지 않아서 15세기 분청사기와 구분되는 예로 볼 수 있다. 상감청자에서 분청으로 변천하는 과정에서 중요한 기준으로 삼을만한 자료로서 가치가 크다. There are many extant celadon wares with the inscription “Deokcheon,” but celadon vases such as this one, with its dignified, elegant shape and exceptionally well-preserved inlaid designs and glaze, are extremely rare. 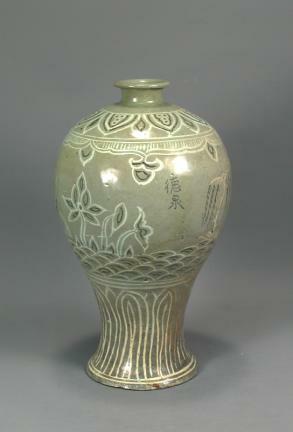 The decorative patterns on the vase, such as the lotus flower and willow designs and the variations in the yeoui patterns (patterns derived from the head of a priest’s staff), are characteristic of inlaid celadon of the Goryeo Dynasty, setting it apart from Buncheong ceramic wares of the 15th century. In this respect, this celadon vase is an invaluable artifact as it is representative of the ceramic wares produced during the transitional period from inlaid celadon to Buncheong ceramic.